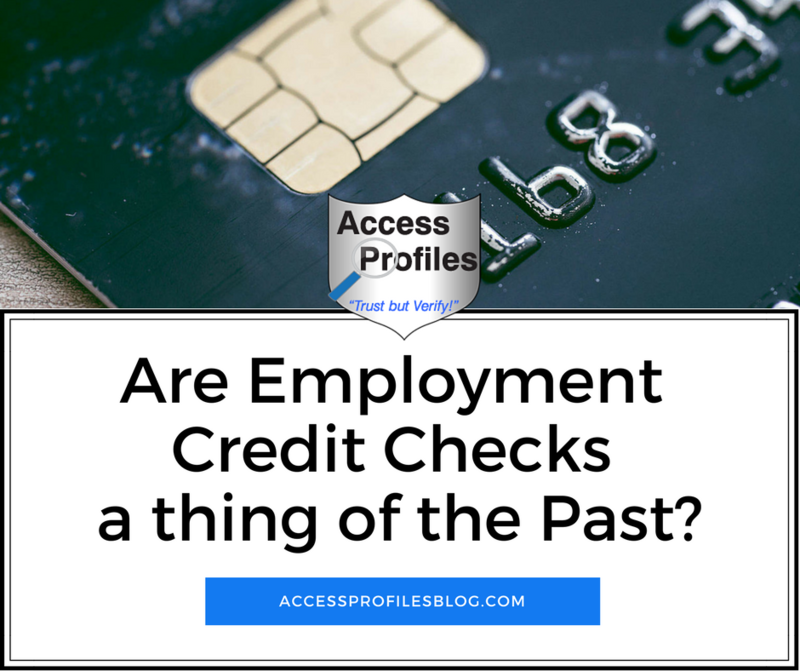 Access Profiles, Inc.: Employment Credit Checks ~ Will They Soon Become a Thing of the Past? Employment Credit Checks ~ Will They Soon Become a Thing of the Past? Should Credit Checks be Used to Help Determine Employment? This bill would limit the ability of employers to require applicants to submit to a credit check or to use any negative information found as a basis for denying employment. According to Senator Warren and her colleagues, employment credit checks are keeping those who need jobs the most from being hired. Their belief is that there are many reasons for bad credit ~ but losing a job along with health insurance tops the list. Such a blow frequently results in people getting behind on their bills. Also at issue is the disparate impact that credit checks have on certain groups; mainly minorities, women, students, and senior citizens. Using credit reports in determining employment results is discrimination against these applicants since they are the hardest hit in a down economy. Warren also believes that there is simply no proof of a link between a person’s credit and their ability to perform in the workplace; “It makes no sense to make it harder for people to get jobs because of a system of credit reporting that has no correlation with job performance and that can be riddled with inaccuracies." Errors in credit reports are definitely a concern, especially when those errors may keep applicants from securing a job. Currently applicants are given the opportunity to dispute or explain information found in their credit report. However, it is still possible that an employer would choose one candidate over another due to a poor credit report. The "Equal Employment for All" bill does allow for credit checks to be used for government positions that require security clearances. There are also some other types of jobs, the banking industry for example, where credit checks for employment in certain positions is required by law. Despite much support for the bill, there are those that oppose these restrictions on employers. This faction supports an employer’s right to access credit information as a way to measure potential employees and the impact they may have on their business. They argue that when an employer requests a credit check for employment purposes, that report is a modified version that reveals credit history, but not an applicant’s credit score. Employers would use the report to look for “red flags” such as judgments or liens against the applicant that would show a pattern. However, this information is generally obtainable when conducting a civil court record check also. Despite these limitations, I do not think using credit checks to determine employment is necessary. The information obtained in a credit check, even the “modified” ones supplied to employers, is simply not needed in making an informed hiring decision. Unless required by law or when hiring for upper level positions, other options are available to employers for determining whether an applicant is the right choice. Verifying employment, education, and past criminal history gives the employer a clear enough picture of the applicant. And since the use of criminal records is already limited in many states, the chance of discrimination is currently addressed when using criminal record checks for employment. While there will be continued debate on the issue, curbing the use of credit checks in making employment decisions seems wise. The economy and job picture has put many in our country in precarious situations. Further penalizing them by limiting their job prospects is counter-productive. Filling and creating more jobs to help people get their lives back in order will do more for our country than putting more obstacles in their way. I believe that every employer has the right and obligation to hire wisely, but relying on credit checks to make those decisions is not the answer. Visit our website for more tips to help your business succeed! Also, be sure to Subscribe to this blog so you won’t miss a thing! *Update ~ the bill is still undergoing Congressional scrutiny in Massachusetts, but other states already have similar laws in place prohibiting employers from using credit to determine employment. (03/12/2018).